Cheung Lai Chuen, dressed in Buddhist robes. This post introduces the second chapter of our ongoing series exploring the lives and careers of martial artists in late 19th and early 20th century China. Very often we artificially restrict our vision of what the traditional martial arts were and how they functioned in society. Looking at some concrete examples of real martial artists helps to correct this tendency. As an added bonus we also discover that many of these people had fantastically interesting lives. Cheung Lai Chuen, Creator of Pak Mei (White Eyebrow). I am really surprised that no one has ever written a book length treatment on the life and martial arts of Cheung Lai Chuen. His biography is fascinating. It is literally a “rags to riches” story that illustrates how the martial arts functioned as an avenue of advancement for hard working individuals who lacked other options. However, his life story also demonstrates the importance of political backing and support for anyone wishing to promote the martial arts Nationalist China. This support rarely came without political entanglements, and the complications that arose from those entanglements could be disastrous. This was especially true during an era when the Nationalist party was actively courting and relying on organized crime to carry out basic government functions. The story of Cheung Lai Chuen has everything, social struggle, mysterious Kung Fu masters, politically scheming generals, gangsters and very difficult ethical decisions. Forget the book, I cannot believe that his life hasn’t been made into a movie. I should state at the outset that I am not a Pak Mei student and my interest in this topic is purely academic. I have drawn on a couple of sources in assembling this brief biographical sketch, however the best discussion I have come across to date has been in: S. L. Fung. Pak Mai Kung Fu: The Myth & the Martial Art. New York: New York Pak Mei Cultural Preservation Association. This seems like a great source for anyone who wants a candid “insider” discussion of this style. Childhood and early Training of Cheung Lai Chuen. Cheung Lai Chuen (also written as Jeung Lai Chuen) grew up in Huizhou District, Dong Jiang, Guangdong Province, China. There are some questions about the date of his birth. Many sources list the year as 1882, whereas his son claims that it occurred in 1889. Whatever the exact case may be, Cheung is a product of the late imperial system and most of his adult life and active teaching career occurred during the Republic of China period. In social terms Cheung’s birth was not particularly auspicious. He was born along the economically less developed east branch of the Pearl River in an area of the province dominated by the Hakka linguistic minority group. Cheung’s father died while he was still an infant. He was also born into the most junior lineage of the local Cheung Clan Association, further depriving the young child of social status. All of this translated into a life of poverty for the newly bereaved family. Taunts and bullying from the other children in the village were also a constant problem. As a result of these generally inhospitable conditions Cheung’s mother moved the family back to her own home village. This early life adversity, as much as any other factor, probably stoked his desire to master the martial arts. Cheung began his martial education at the age of five under the tutelage of a respected local doctor named Lam Sek. Lam was a student of “Vagabond” or “Wanderer’s” style Kung Fu. He introduced the boy to both boxing and weapon sets that would remain in his repertoire throughout his life. Next he studied with Lei Mung who introduced him to Lei (alternately ‘Lee’ or ‘Li’) family style boxing. His education with this new teacher focused on close quarters combat and a new set of weapons. Once again, many of these techniques would reemerge in his later creation, Pak Mei (sometimes spelled “Bak Mei,” which may or may not have a lineage specific connotation). 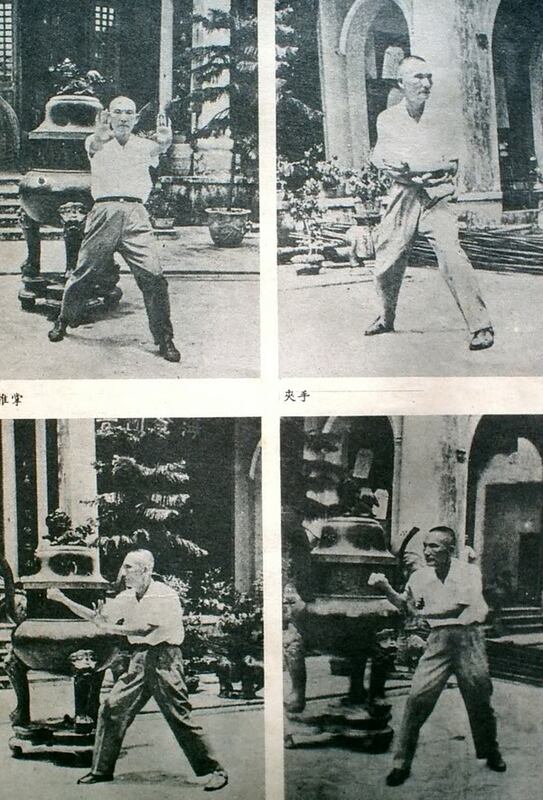 Cheung was also greatly influenced by Dragon Shape Boxing. His initial exposure to the system was through the ground work taught by Lam Yun (father of Lam Yiu Gwai). He later went on to study with Lam Ah Hap, another Dragon style expert, who taught him the form Lung Ying Mo or Dragon Shape Sensing Bridge. As a young adult Cheung Lai Chuen moved to Guangzhou seeking employment and a little excitement. Not a lot is known about this period of his life. He worked a number of odd jobs and continued, like so many other country boys, to practice the various boxing styles that he had learned in his spare time. He may have taught some friends and cousins (who formed his immediate social support network), but he did not open a school or take on the title of Sifu at this time. 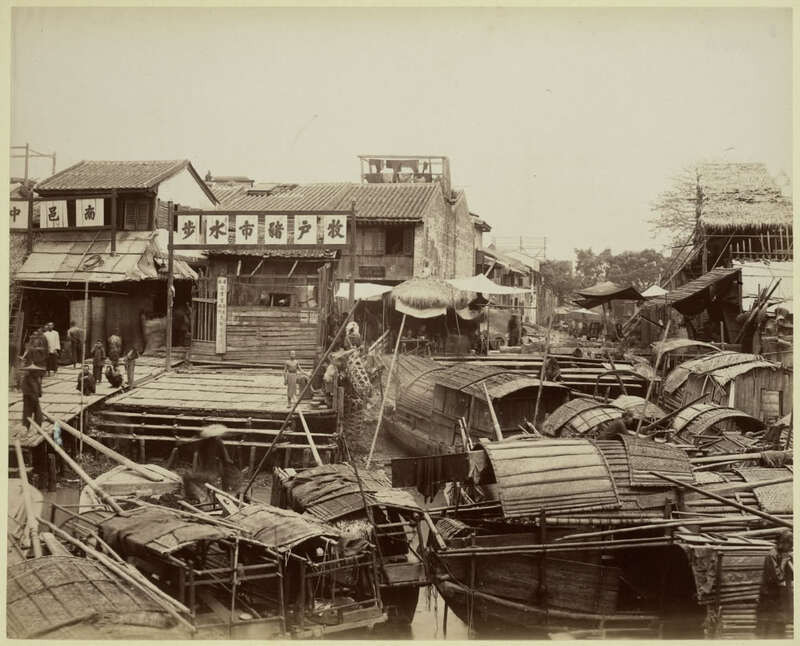 Guangzhou in the 1890s. This is how the city would have looked when Cheung Lai Chuen first visited it. It would seem, however, that Cheung Lai Chuen’s martial education was not quite complete. Around 1908 Cheung claims to have encountered a young Buddhist monk sitting in the middle of a traditionally Manchu neighborhood and teahouse in Guangzhou. His name was Lin Sang. 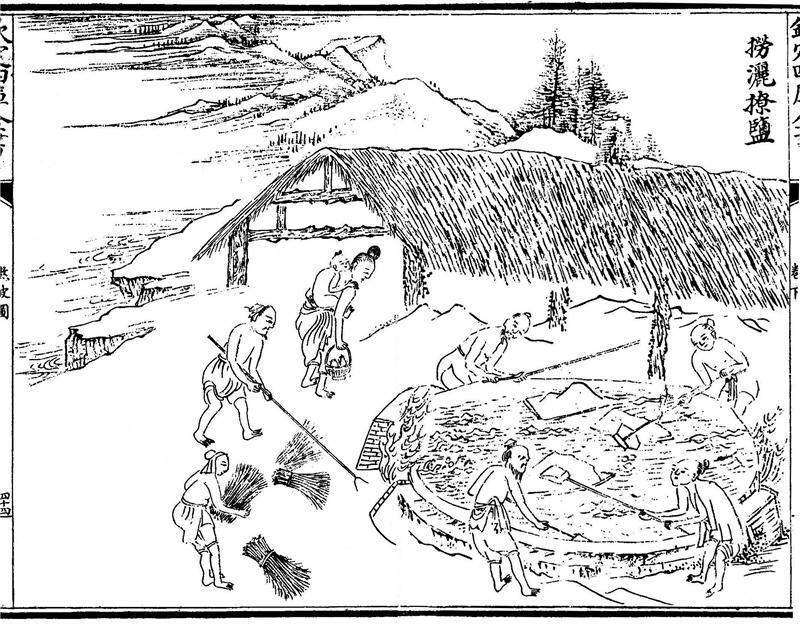 Relations between the Han and Manchu communities were deteriorating rapidly, but the teahouse featured cockfighting and gambling which interested the young Cheung. Over time he became curious about the frequent appearances put in by the young monk, who generally held himself aloof from the commotion and never seemed to be bothered by the Manchurian patrons. Upon further investigation Cheung managed to discover that Lin was in fact a talented martial artist and the student of a monk named Juk Faat Wan who resided outside of town at the Gwong Haau Ji temple. The story goes that Juk Faat Wan was furious to learn that his disciple had been demonstrating his martial arts to outsiders. He rebuked Cheung’s requests and refused to teach him on multiple occasions. Nevertheless, eventually he was overcome by the humility and sincerity of Cheung’s desires and took him on as a student. In fact, Cheung was his only student, with the exception of Lin. 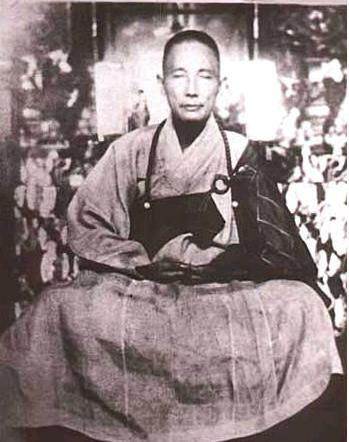 Juk Faat Wan required that Cheung live in the temple and not leave for a minimum three year period as he studied the new style called “Pak Mei.” At the end of this period Cheung had mastered all of the normal fighting skills of the school but had yet to learn his Sifu’s more esoteric techniques such as walking on vertical walls and fighting with hidden weapons. Unfortunately the political upheaval of the country dictated that Juk Faat Wan and Lin Sang needed to leave for another temple, and after three years of isolation Cheung Lai Chuen wanted to return to a more secular lifestyle. The three men parted ways. While Cheung went on to become famous, no one ever heard of the two monks again. The implication here is that they may have been some sort of revolutionaries with a role to play in the events of 1911-1912. This account poses a number of problems for historians. Obviously the most important of these questions would be whether Juk Faat Wan even existed and what, if anything, he contributed to the style known as “Pak Mei” that Cheung Lai Chuen later taught publicly. Sometimes it is just not clear how to handle a story such as this one. If Cheung had claimed to have visited the southern Shaolin temple in Fujian it would be easy to dismiss the entire account out of hand. At this point it is generally accepted by scholars that this structure never existed except in popular literature. Mount Luofu in the Huizhou district. 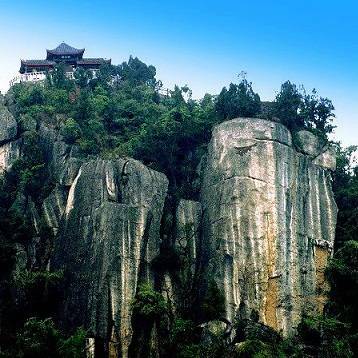 The mountain has traditionally been the home of many Buddhist and Daoist temples. According to popular tradition a number of important local martial artists have studied here, making it sacred ground for practitioners of many Hakka arts. Yet there were small temples all over the countryside, and the monks and novices who resided in them occasionally had to study martial arts to ensure their own safety in dangerous times. This was never the primary function of these monks, and it is not clear that there was anything uniquely Buddhist about their martial arts, but this sort of stuff did happen. Nick Hust, in his book Sugong (2012), provides a wonderful account of real schools run by martial monks in both Southern China and South East Asia. Still, there are a number of problems with this account. On a personal note, Cheung’s claim to have won the older monk over with his patience and humility is odd as these are not characteristics that other observers of his life noted in much abundance. One must also be suspicious that Juk Faat Wan doesn’t seem to have left much of a paper trail behind him. This stands in marked contrast to the contemporary monks discussed by Nick Hurst who actually do appear in the historical record and can be subjected to historical scrutiny. Of course it is always possible to wave-off these mundane concerns with the suggestion that the two mysterious figures were really revolutionary agents on a secret mission to overthrow the government. Yet if that is the case then it seems unlikely that they would have risked bringing in an outsider (compromising their security) only to gain nothing by the exchange. It is also extremely odd, and strangely convenient, that Juk Faat Wan would have taken on only a single student. Not only can there be no witnesses to Cheung’s claims, but it is also not in keeping with what we do know about other, better documented, martial monks. Generally speaking it took a lot more than one student to defend a temple and its property. Dozens of students were needed for a mission like that and temples with martial monks might have up to a hundred students. Then there is the fact that so much of what Cheung learned from his first four teachers ends up in Pak Mei, the art that he supposedly learned from Juk Faat Wan. It is certainly possible that Cheung studied with another teacher between 1908 and 1911. It is even possible that this happened at a temple. But it is hard to see how any of this is necessary to understanding the art that he ended up promoting. In the final analysis Pak Mei is much more a Hakka art, reflecting the ethnic styles of the east branch of the Pearl River, than it is in any way a “Buddhist” art. While it is hard to say much about the veracity of this account without more evidence, I think that we can conclude that it derives its value from being a good creation myth, much like the story of the southern Shaolin temple or Ng Moy. It probably told students a lot about the social nature of what Cheung Lai Chuen was trying to promote, while telling them relatively little about where his techniques actually came from. Whatever the nature of his association with Gwong Haau Ji, the temple does not seem to have had much of an impact on Cheung’s immediate career progress. Upon returning to secular life he traveled to his mother’s home village and through the intercession of an uncle managed to secure a job working for the salt department of Gongmun Township. Salt is an important good, necessary for life and easy to transport. Better yet, there aren’t many things that can take its place in dietary or industrial processes. In economic terms we say that goods like this are relatively “inelastic.” No matter what happens to their price consumers are forced to continue to buy them, even at the risk of impoverishing the household budget. Governments have long known that taxes work best, and are hardest to evade, when they are placed to inelastic goods that must be traded and sold in centralized markets. The Chinese were no exception and for hundreds of years the revenues from the “salt tax” was an important source of funding for the national government. As one would expect informal, often criminal, networks quickly formed with the goal of smuggling and selling untaxed salt. This was difficult, dangerous work, but it was also very lucrative. Provincial officers were forced to create salt agencies to enforce the tax and combat smuggling. Since this was often rough work, both salt tax offices and the salt smuggling gangs were a frequent source of employment for young martial artists. It is probably no coincidence that in the Wing Chun creation myth Leung Bok Chao (the fiancé of Yim Wing Chun) is a “salt merchant.” Such individuals had to travel and be ready for trouble. Of course the myth never says which side of the official trade he was on. That is left to the imagination on the individual storyteller or listener. Cheung had no doubts about which side of the issue he was on and who he worked for. In fact, this job really set the pattern for a lot of his subsequent success in life. He learned that the government was a powerful source of patronage, and gaining the favor of the right official was the key to promoting ones career, even as a martial artist. Accounts indicate that Cheung succeeded admirably in the rough and tumble world of tax enforcement, confronting smugglers and breaking limbs. His prowess in this department won him the admiration of his colleagues who became his first set of official students. It was the reputation that Cheung made while working for the government that allowed him to go out and open his first set of schools, building a truly impressive network of public institutions. Purely commercial success never seems to have been enough for Cheung. Whenever possible he attempted to make contact with government officials who might recognize the value of his art. On the one hand this may have been driven by universal human desires for recognition or power. One certainly cannot discount that possibility. Nevertheless, I suspect that there was more going on here. It is important to realize that the Pearl River Delta was an incubator for martial artists. There were a lot of styles and they were all in competition with one another. During the 1920s and 1930s the Nationalist government entered the realm of the traditional martial arts. It started by creating the Central Guoshu Institute and moved on to mandate hand combat training for police officers, the military and even school students. The Guoshu movement also sought to promote the martial arts through a variety of programs, tournaments and publications. In essence, the government became the single biggest consumer in what was already a tight marketplace. Unfortunately for the folk styles of southern China, the government also had some pretty distinct tastes when it came to determining which sorts of instruction they would be willing to pay for and promote. These did not include the “simple” or “primitive” boxing styles of the south. Instead the Central Guoshu Institute spent a lot more time promoting the “Shaolin” and “Wudang” arts (their terminology) of Northern China. In fact, they even imported large numbers of northern martial arts experts into the south to teach. After opening a branch of the Central Gusoshu Institute in Guangzhou in the late 1920s the military governor of the province signed an order prohibiting the opening of any new schools that were not under its direct control. Luckily a political purge (totally unrelated to the martial arts) intervened and the order was never carried out. If it had gone through this would have been catastrophic to the local southern styles. I suspect that Cheung, through his prior background and contacts in government, realized that in Nationalist China survival was not ensured by quality alone. One had to convince key members of the government of your loyalty and worth. As an added bonus they could then provide access to vast pools of “official” students that would guarantee your economic success. Cheung Lai Chuen played this game with great skill, and he lobbied hard to see the southern Chinese arts acknowledged and even included in the official curriculum of local Guoshu run organizations. His first major success in this area was meeting and impressing Lei Dat Ng, a high ranking police official in Guangzhou. Lei then assured that Cheung would be appointed to train officers at the city’s law enforcement headquarters. Additional contacts in the military gave Cheung access to the prestigious Whampoa Academy where he also taught a number of classes and led a civilian Dadao (Big Sword) unit. Some of his bayonet techniques were also adopted and added to the official infantry curriculum. These were prestigious achievements; yet even shining distinctions could not obscure the dark clouds that were starting to gather on the horizon. Cheung owed much of his social statue and economic success to his friends in the Nationalist Party. He had always been a successful businessman, but it was his contacts with government that had made him a force in the national martial arts scene. That meant that Cheung’s fate was now directly tied to the GMD, and things were not going well for the Nationalists. (Continued in Part II). Cheung Lai Chuen demonstrating movements from Pak Mei (White Eyebrow) Kung Fu.